It's Sunday and what better day to stumble across these! 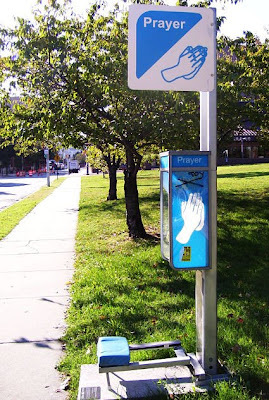 The first is a prayer booth! 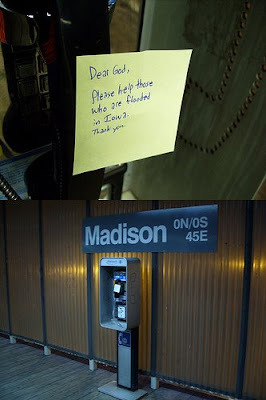 The second is an example of someone leaving post-it-notes to God in a phone booth. These images bring back memories of my old Baltimore Cathecism when I was a young and impressionable grade-schooler. That thing scarred me for life with images of such things as a bottle of chocolate milk to portray mortal sin. But the image that the pictures above stirred was that of a depiction of a child praying, with God in the clouds and a telephone between them with the caption "prayer is a phone call to God". 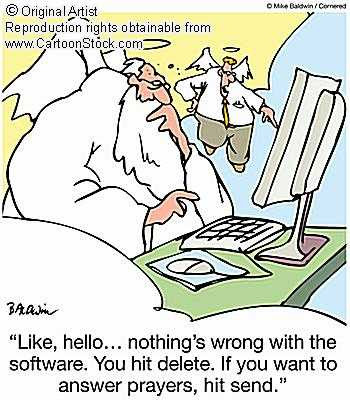 I've searched the net and can't find it. Too bad. The picture below provides an example of the type of imagery used to impress kids.